The Bone Supremacy was borne out of an idea after much discussion at the bar one night after a Back To Basie concert back in 2007. The regular four Trombonists in The Bone Supremacy are all regular members of that fantastic poll-winning big band. Ian Bateman started the discussion when he brought up the idea of re-creating Five-A-Slide, a trombone band that was very prominent at jazz clubs and festivals in the 1970s and 1980s. That band featured the top jazz trombonists of the time Roy Williams, Campbell Burnap, Pete Strange, Roy Crimmins Jim Shepherd, and latterly Ray Wordsworth amongst others. After general agreement with the idea, then much deliberation it was decided that a new name must be found as this band was going to be different. We are however indebted to Cathy Strange for allowing us exclusive access to the Five-A-Slide library penned by her late husband Pete Strange. We also acknowledge the help we have received from Digby Fairweather and Roy Williams who are both keen to see this new venture take the stage. Anyhow, back to 2007! We spent the next 3 months trying to think of a name! Strong candidates were Bone Jovi!, Dem Bones, Sludgepumps, Slide By Slide and many others that often had us roaring with laughter. We can't remember who said it, but somebody said "Bone Supremacy" and the hush that followed told us we had at last thought of a name. Every player in the band is a very talented jazz musician in their own right and by that token they are invariable busy. It was therefore at the back of everybody's mind about this new band but no impetus existed to actually make it happen. Then in December 2008, Ian Bateman met up with Digby Fairweather on a gig and told him of the idea. Within days Cathy Strange had contacted Adrian Fry offering the Five-A-Slide library after an initial call from Digby - we instantly had a repertoire! This was the catalyst and suddenly Adrian was at work writing more arrangements, with Ian transcribing recordings by Kai Winding, Frank Rosolino and JJ Johnson then passing them to Adrian to work his magic - in many cases adding a 5th trombone! The 5th trombone is a policy decision made right from the start. Ian Bateman and Adrian Fry are the co-leaders of the band with Adrian looking after playing matters and Ian looking after bookings and admin. 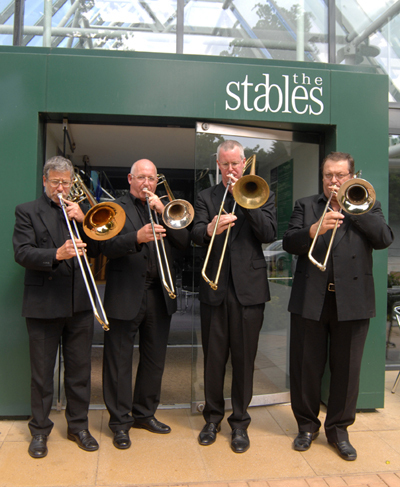 Andy Flaxman is our first choice lead trombone and Chris Gower will be our first choice Bass trombone, although he is equally at home playing lead. We decided as a policy to leave the 5th trombone as a 'floating chair'. 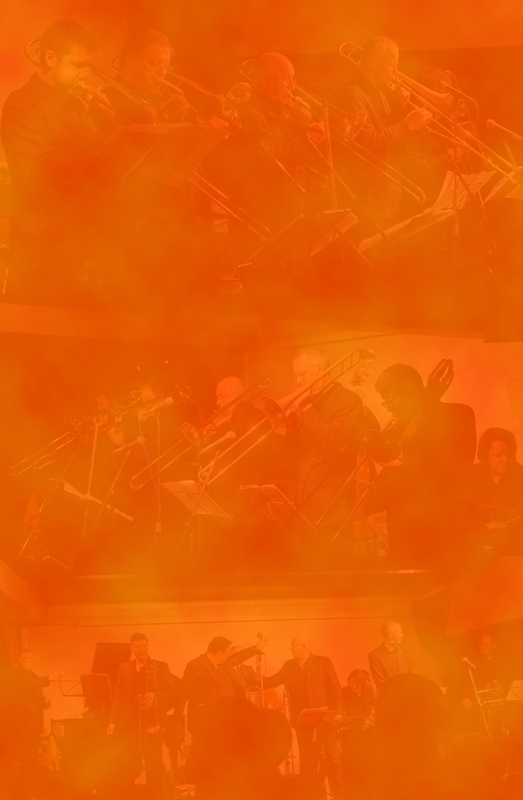 We therefore will be inviting guest trombonists to play with us. This of course could change, but it seems to be working well, especially with jazz festivals where we can possibly use a trombone player already booked at the festival. The same policy will apply to the rhythm section. The music can be very difficult so we prefer to use our first call players, but there is some flexibility here if necessary. A band with five trombonists needs to be diverse, especially as it must hold the audience's attention for a couple of hours. We therefore have made a concious effort to play a variety of styles, from the traditional Muskrat Ramble to Michael Brecker's Delta City Blues (it's awesome on Tenor Sax - wait until you see and hear five trombones playing it!). Another strong feature of this band is the a cappella style of playing - in other words without accompaniment. Have a listen to 'Not Like This' (it's on the mp3 player on the Repertoire page) and you'll know what we mean. You'll not only hear some stunning playing but we will also entertain you. You can have a lot of fun with a trombone! If you put five of them together you have a mixture that is sure to put a smile on your face!!! The Bone Supremacy is entirely self sufficient as we are able to supply our own music stands, stage props and PA System where required and we always insist on looking smart and presentable! So after a lot of debate and back-burning, suddenly within a three-month spell we are out there ready to unleash ourselves on the jazz world! We have been holding regular rehearsals at The Bull's Head in Barnes and judging by the attendance at rehearsals by a few other trombone players and other familiar jazz 'faces', word is spreading fast! So, here we are, The Bone Supremacy! Coming to a venue near you soon!